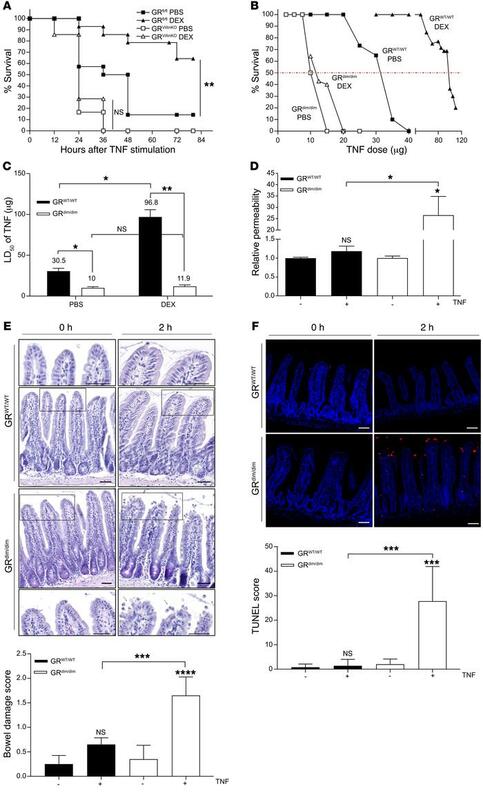 IEC GR and GR dimers play an essential role in protection against TNF-induced lethality, gut permeability, damage, and cell death. (A) GRfl/fl (n = 14 per group, black) and GRVillinKO mice (n = 7 per group, white) were pretreated with PBS (squares) or with 10 mg/kg DEX (triangles). Thirty minutes later, mice were injected with 35 μg TNF, and lethality was monitored. P values for survival curves were analyzed with a log-rank test (combined data of 2 independent experiments). (B) TNF dose-response curves of GRWT/WT (black) and GRdim/dim (white) mice pretreated with PBS (squares) or with 10 mg/kg DEX (triangles) for 30 minutes (n = 8–10 per group; combined data of 2 independent experiments). (C) LD50 values of TNF are depicted on top of each bar for each group. 95% confidence intervals were calculated for the LD50 of each group. (D–F) GRWT/WT and GRdim/dim mice were injected with PBS or 12.5 μg TNF (n = 10 per group; combined data of 2 independent experiments). Asterisks refer to significant differences compared with PBS control, unless indicated otherwise. (D) Relative permeability, 8 hours after TNF challenge, is based upon systemic appearance of orally gavaged FITC-dextran in plasma samples. Standard H&E (E) and TUNEL staining (F) on ileum samples 8 hours after TNF were scored in order to calculate bowel damage and TUNEL scores, respectively. Notice a perfect appearance of GRWT/WT villi, but villi damage, shortening, cell death, and loss of goblet cells in GRdim/dim as well as TUNEL signals at villi tops and crypts. Scale bars: 50 μm. Bars represent mean ± SEM. P values were calculated using 2-way ANOVA. ****P < 0.0001 ***P ≤ 0.001; **P ≤ 0.01; *P ≤ 0.05.